The challenge this week is “Mailboxes”. I think the animals were the magic of my work. I have a dog that paid for this entire farm. Just an old dog that I bought for a dollar at a pound. She had mange and blisters all over. They were going to destroy her that afternoon. I said, “I’ll take that one.” She went to all my shows with me. I used her in four figurines and eleven plates. 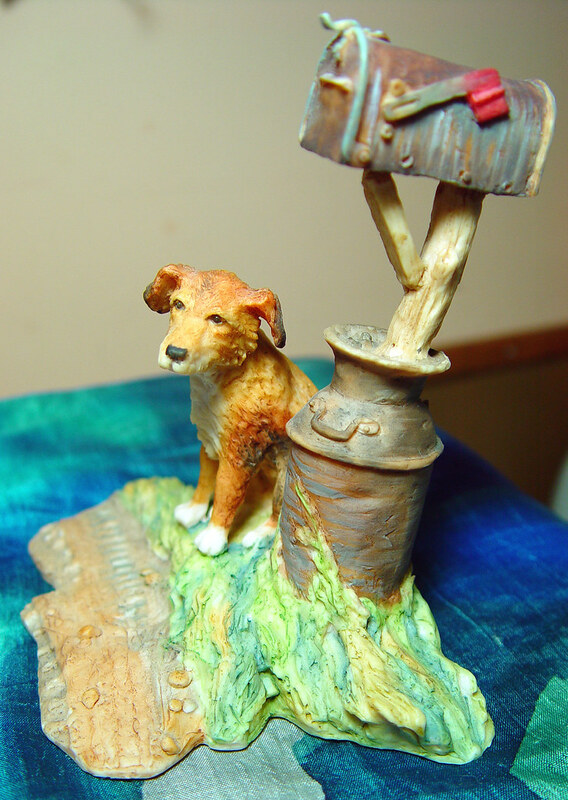 The very first figurine I did was the dog sitting by the mailbox. It was an instant hit. She made me tons of money. I still give her a little credit for paying for the farm. In fact, that’s why I put a paw print on my work. Oh I like that. The quote adds a very special touch. What a cool photo. I wouldn’t have thought of a miniature. That sculpture is adoreable. What a cute way to do the challenge! I love success stories like his! What a neat figurine, too. Nice job! I like that figurine – good shapes and colors, and very well photographed. And how wonderful that the artist and the dog benefited so much from meeting each other! Anything with animals I love. I like your pics that you post. Very nice.